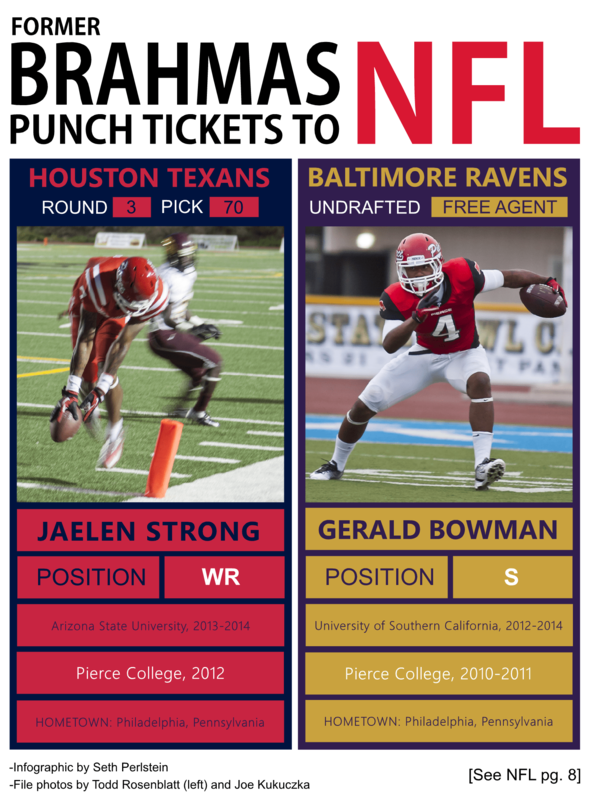 Two former Pierce College football players, originally from Philadelphia, are getting a crack at the NFL this season. Wide receiver Jaelen Strong was drafted no. 70 overall by the Houston Texans. Strong transferred from Pierce to Arizona State University in 2012. In March, ESPN draft expert Mel Kiper Jr. projected Strong to go no. 18 overall, while NFL.com expected him to go first or second round, but he fell to the third. While at Pierce, Strong finished second overall in receiving yards per game at 126.3, had 15 touchdowns and 67 receptions, according to the California Community College Athletic Association (CCCAA). Strong didn’t respond to interview requests, but posted on Instagram that he has chosen to wear no. 11 for the Texans to represent being the eleventh receiver picked up in this year’s draft. Gerald Bowman played safety and returned punts for the Brahmas in 2010 and 2011 before transferring to the University of Southern California. Bowman was undrafted, but was signed as free agent by the Baltimore Ravens. He said he’s thankful for all the people (coaching staff, counselors, professors and the training staff) for always being supportive when he needed it. As for fitting in with his new team in Baltimore, Bowman said he has the same “aggressive style” as the team. He wants to show the Ravens what he’s got, but still plans on being himself. Join the conversation on these former Brahmas by using the hashtag #BowmanStrong on Twitter.